Ah, spring: sunnier skies, warmer temperatures, and…the return of sweat. If you’re like Kevin Kline’s character in A Fish Called Wanda, you may love the smell of your own B.O. Or, if you’re lucky, a healthy diet that includes plenty of vegetables and water may allow you to go without deodorant some days. Perspiration (a natural and healthy body function) has almost no odor, but the bacteria that breaks sweat down into acids does—which is why most of us reach for deodorant. Meanwhile, smearing those chemicals onto my armpits every morning while waiting for further research is just plain scary and, luckily, also unnecessary. 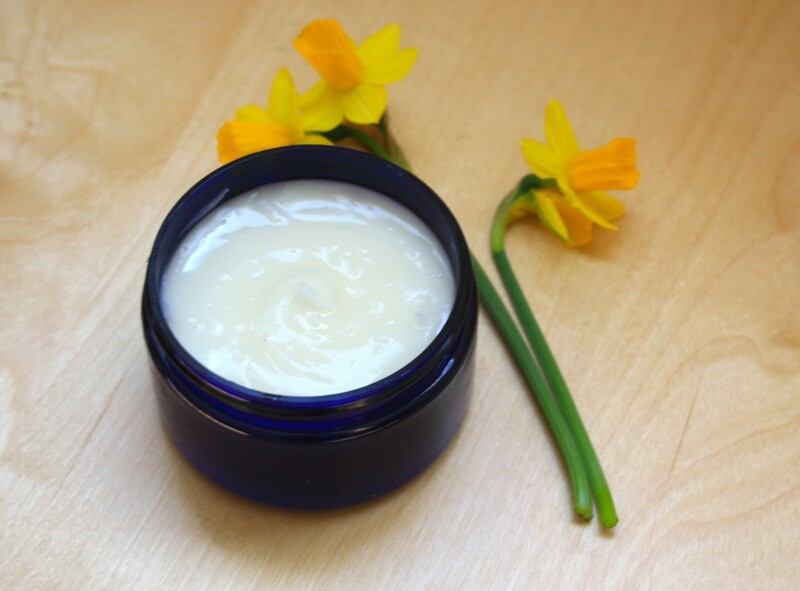 When my daughter was home for a spell last summer, she mixed up a batch of homemade deodorant one afternoon using just what she found in my kitchen cupboards and some lavender essential oil I had on hand. I gave it a try and was hooked. We’ve both been happily using her homemade deodorant recipe for months now. But the baking soda that’s in most deodorant recipes has given some people skin irritation or rashes. Also, the naturally antimicrobial coconut oil base for the deodorant melts at 72°F, so it has to be kept in the fridge during the summer. I’m going to give you a whole slew of recipes and solutions to address these issues and help you smell fresh without worrying about the scary chemicals in most commercial deodorants. One quick reminder: Don’t apply any deodorant or any solution immediately after shaving– wait 30 minutes. 1. 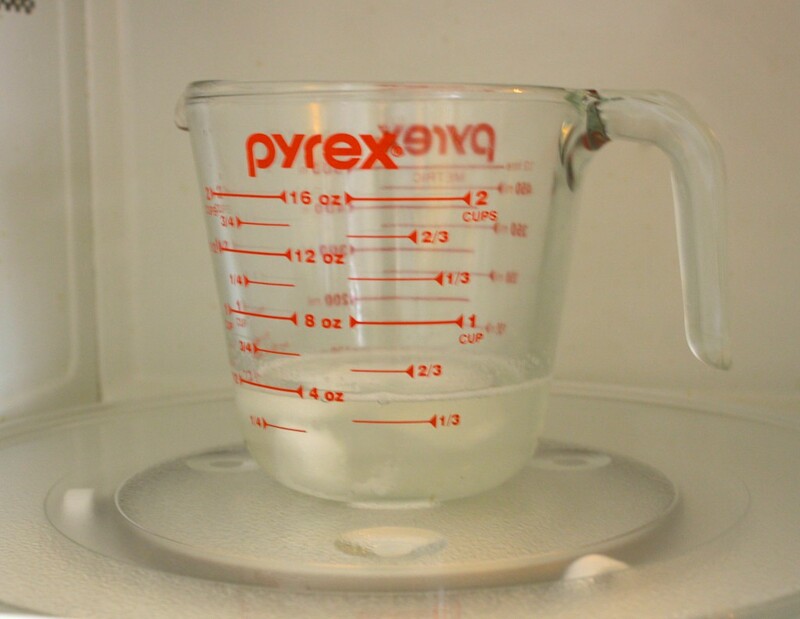 Warm the coconut oil in the microwave (using ten-second intervals) or in the top of a double boiler just until it melts. Heating coconut oil this way will not destroy the Medium Chain Fatty Acids (MCFA) that make it antimicrobial, but you can skip this step— it will just make blending and pouring a little harder. 2. Stir in the baking soda and the cornstarch or arrowroot powder (you can find arrowroot powder at most natural foods stores). 3. Making sure the mixture is not too warm, add the lavender or other essential oil. You can also add 5 drops of tea tree oil, which has antibacterial qualities. 4. That’s it! 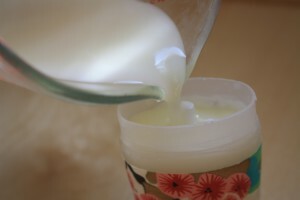 Now pour the mixture into an recycled deodorant dispenser for easy application or into a lidded jar to apply by hand. 1. 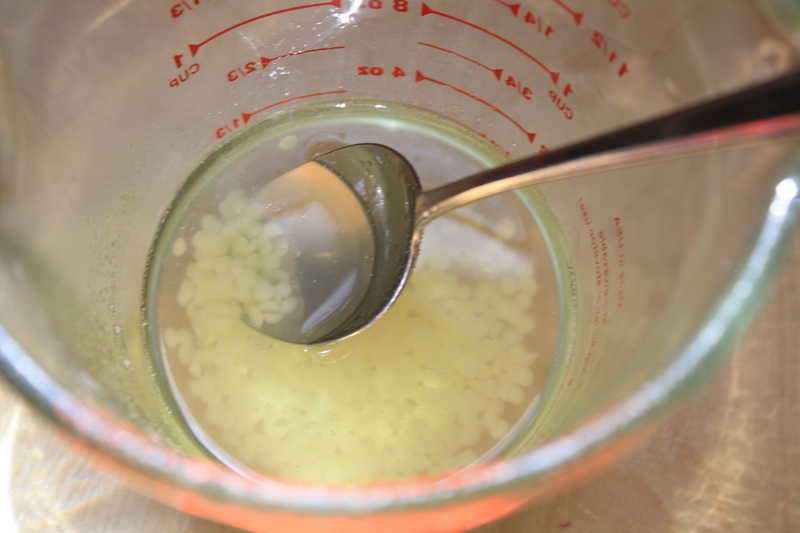 Warm the coconut oil in the microwave (using ten-second intervals) or in the top of a double boiler just until it melts. Heating coconut oil this way will not destroy the Medium Chain Fatty Acids (MCFA) that make it antimicrobial, but you can skip this step—it will just make blending and pouring a little harder. 4. 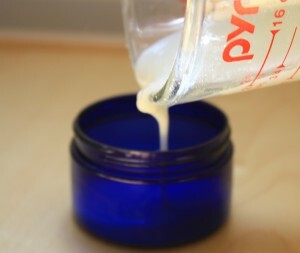 Now pour the mixture into an recycled deodorant dispenser for easy application or into a lidded jar to apply by hand. 2. Stir in the baking soda and the cornstarch or arrowroot powder. If you find that even the small amount of baking soda in the deodorant recipe for sensitive skin irritates you, try the following solutions in place of deodorant. They will adjust the pH of your underarm’s skin and fight the bacteria that causes odor. Mix the water and the tea tree oil and and apply to your underarm area with a cotton ball or make a larger amount and apply using a small spray bottle. Mix the ingredients and apply to your underarm area with a cotton ball or apply using a small spray bottle. Mix the carrier oil and the essential oils and apply to your underarm area with a cotton ball or make a larger amount and apply using a small spray bottle. 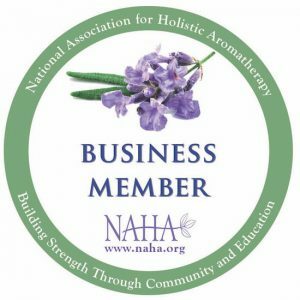 Need to stock up on essential oils? Use the links below! This is awesome! 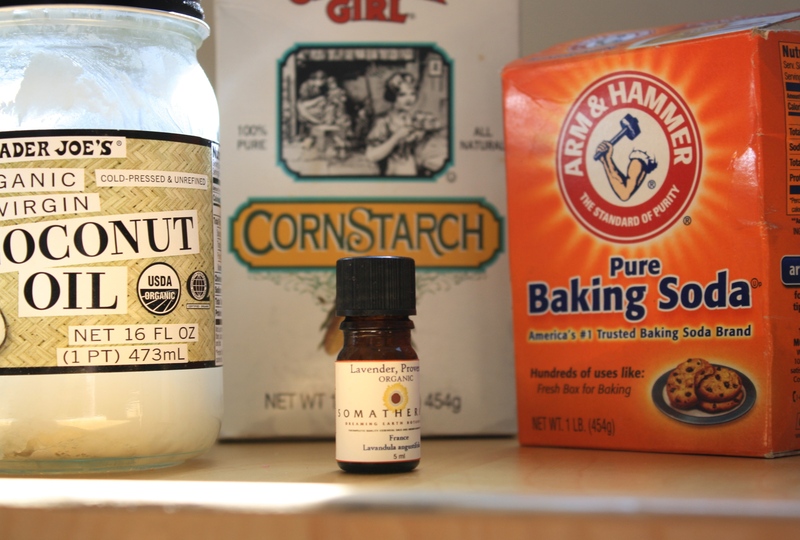 I’ve been worrying about using commercial deodorant and am excited to try these recipes. Just when I needed it, chanced upon this post of yours….I have just started using doTERRA essential oils. Can I use them for these recipes or would the amounts vary? Asking because I’ve heard they are very potent. The recipes will work with any essential oils, certainly. Returned here after quite sometime to say a big “Thank You”…these rock!!! 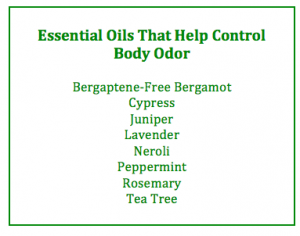 I’ve never thought of making a deodorant out of essential oils. I’m definitely going to try this when I can! Thanks for posting. Thank you for sharing such great information! I have been using deodorant alternatives for years now. I’ve bought some from the health food store. I’ve used the “crystal” type also and it’s okay. Most recently, I started using a borax solution (Borax and distilled water)and following with ACV & water mixture. I look forward to trying something new and pleasing to the senses. Thank you for your post. I think I may try this next week. Just one small question before buying the ingredients, could you please tell me how long the deodorant would last in hot and humid weather? I live in China, FYI. Definitely do the no-melt one, with the beeswax — you don’t want to risk it in the summer. I enjoy essential oils. Thank you for the post that I chance upon. 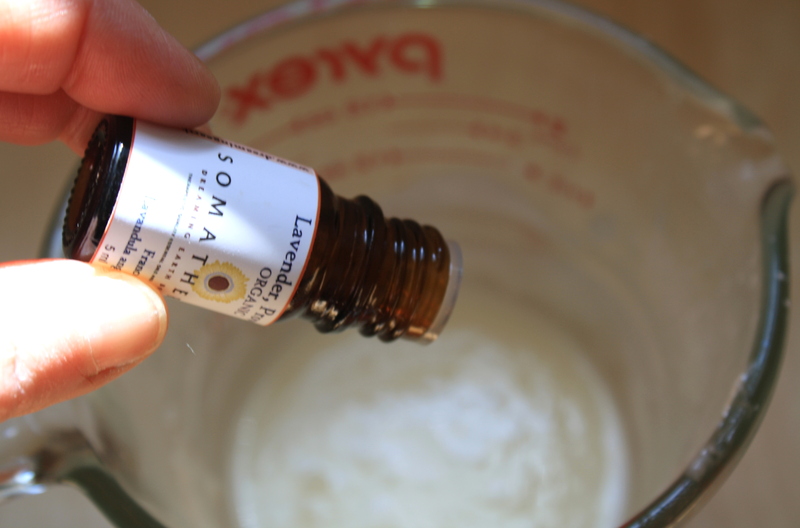 I definitely will try making my own deodorant with lavender oil. I personally don’t like the smell of coconut oil, but glad to know there are alternatives. I started using a drop of lavender and tea tree e.o for their antibacterial properties then dust with a little arrowroot powder to absorb moisture. It is working great so far. Baking soda causes my skin to turn dark and itchy. Does the E.o. Leave on stains on your clothes? It’s not been a problem as far as I’ve heard from anyone or from personal experience. I tried a period of using only coconut oil with a drop of lavender + tea tree, left oil stains on all my clothes. Also tried baking soda + arrowroot powder, made my armpits dark. So now, sticking to crystal salt, which is not overly effective on me. So the search is still on. Use Fractionated Coconut Oil.it does not leave stains. I use magnesium oil (1 tbsp) instead of the baking soda. It works very well and no irritations. I just wish I could find another substitute for tea tree oil. I use tea tree, frankincense, neroli and ylang ylang. I used the tea tree because it was supposed to help. It does, but I hate the smell. If you really don’t like tea tree, try substituting lavender oil and see how that works for you. Tea Tree definitely has a strong aroma! I just made some with Tea Tree and when I added some Lemongrass (which is an effective deodorant) the fragrance overshadowed the Tea Tree oil! Try using Niaouli (Melaleuca quinquenervia) instead of Tea Tree, it is from the same plant family but is much gentler and has a more pleasant odor. The bee’s wax tip! Thanks! And just fyi- go to Maximizedliving.com and you’ll discover not only new and vital information regarding minimization of toxins, but epic health tips, life changing care, and a new look into healing. Is it okay to use fractionated coconut oil which is a liquid at room temperature? And is the coconut oil measured as a liquid or a dry ingredient? Fractionated coconut oil is always in a liquid state. We’re using regular coconut oil (sometimes called 76 degree) in this recipe–it’s the one that can become solidified. And yes, measure it as a liquid. I also like these recipes as I can add my own fragrance / essential oil! Can you replace the beeswax with soy wax flakes? I have seen this used in massage candles so it should be ok for sensitive skin? I don’t have any experience with that but I don’t see why not! Baking soda can be irritating to many people in any amount, so plain talcum powder or baby powder can be a great substitute. In fact, I often keep a small baby powder with me when I have to leave the house (southeast Texas means you pretty much ALWAYS sweat at some point!) and simply wipe away the moisture and apply a bit of powder to help keep me dry. One last note: for those just now switching from commercial deodorant to homemade, there may be a period where your body needs to adjust. Any time you suffer from either body odor build-up (bacteria) or a yeast build-up (indicating you need to use less of the powders), they both have the same simple solution: after showing or washing your armpits, use a cotton ball to apply apple cider vinegar to the complete area and let it dry. 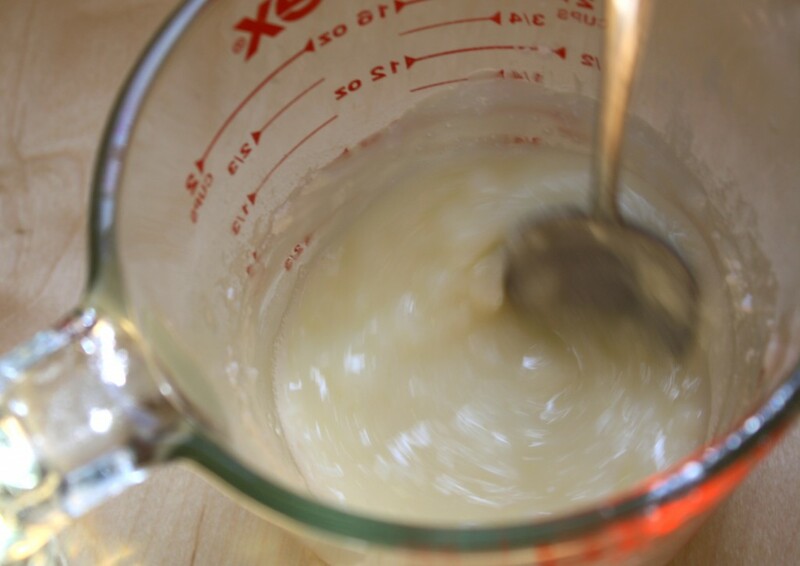 It may take more than one application for a yeast build-up before the yeast comes right off. I hope you all enjoy your freedom from commercial deodorants….and the proclaimed benefits over time of not only sweating less, but having less pungent sweat. Baby powder not a good option. The J&J company who market it as being baby safe have just lost court battle due to it causing cancer! Just made my first batch of diy deodordent. Looking forward to the results!!! 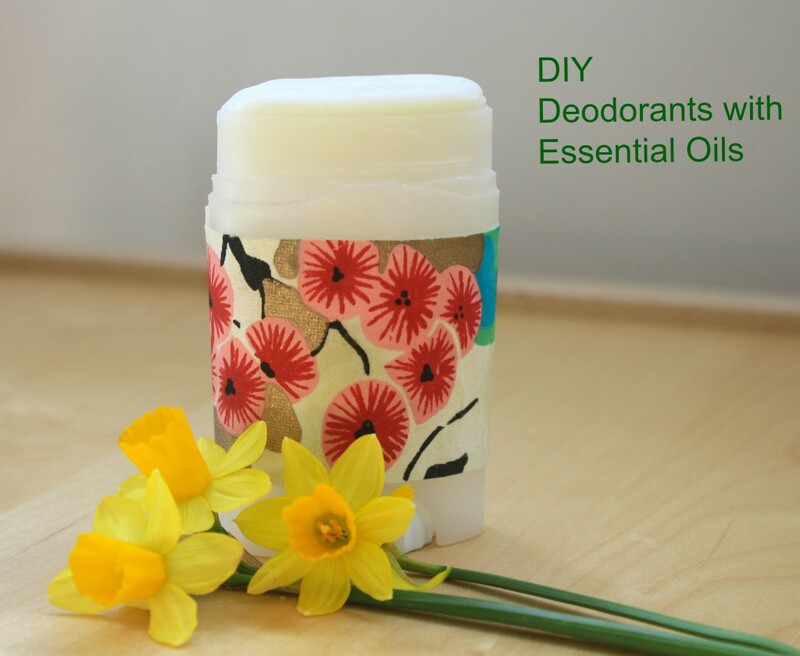 I have been using your deodorant recipe for a while, and it works perfectly for me…My daughter has recently reached the age of needing to use deodorant herself, so I am making a batch for her now! Thank you for sharing! Just made my first batch of deodorant. I had some extra after filling an old deodorant stick, so I poured it into another container. My question is, if I wanted to transfer the leftover deodorant into the stick later on, could I melt it on low heat to get it back to more of a liquid state without ruining the product? Thanks for your help. Hi, just made my first batch. I can see the oil separating from the powders. Any solution for that? So ever since I hit puberty is when it all started,as I like to say I sweat like a man working in a mine. So Here I’am laying in bed with my husband when he turns and sniffs me. Mind you his head was resting near my chest and arm.I mentioned how the deodorant I had switched to just last night had not worked well. He knows what I go through and how much $ I use buying deodorants. He jokes and says “you know what you should just use sponges”!! SPONGES!!!? I immediately pictured that image . Here I was expecting some great product .. We both bursted out with laughter I even shed a tear. I elbowed him in the rib , at last he concluded by saying “maybe you should try your tea tree oil”. A lightbulb went off reached for my phone and here Iam . How I adore him. I’m about to make this right now . The tea tree soulution and sensitive deodorant. Can i use cooking oil instead of coconut oil? I wouldn’t . . . most stores sell coconut oil–you can get a small amount locally. Can I use cocoa butter instead of shea? Hi Michelle, cocoa butter has a much harder consistency than shea, so you’d have to adapt any recipe with that in mind — either add in more carrier oil or take out beeswax if that’s a component. Coconut oil is what we usually recommend. I haven’t personally tried cocoa butter, but it’s always interesting to experiment and see what works for you. Quick question. Does the deoderant become firm? Do i put it in the fridge? It’s pretty soupy. Yes, I’d keep it in the refrigerator. Super excited to try these. I’ve been using commercial deodorants for years and they’ve made my skin go dark. Any suggestions to combat this? Hi Anna, using coconut oil and apple cider vinegar might be helpful with skin discoloration. Some sources say baking soda helps and some say it can darken the skin, so you might want to start with a recipe that doesn’t have baking soda and see if simply using a natural deodorant helps. Let us know! The post didn’t mention the method application of the 1st process. How much and how should I apply it? Hi Aveen, just apply a little bit by hand. Thanks!